We have been lost in the beauty of the Sea of Abaco below Whale Cay. For the past week or more, we have been exploring areas of beauty and crystal clear waters unlike anything we have seen before. Everyone talks about the “Gin Clear” waters of Abaco and the Bahamas, but until you see it, swim in it, and snorkel it, you simply cannot understand how clear it is. This area “South of the Whale” offers so many anchorages and interesting towns such as Hopetown and Little Harbor, that it is impossible to select a favorite location. Besides the towns, there are spectacular beaches, low tide sand banks and gorgeous coral reef formations to explore. The winds are common trade winds, blowing from the east at 15 knots, and the destinations are mostly north and south, so we can sail to nearly everywhere. After sailing, we select a beach to anchor behind or a town to move into and set the anchor in 6-10 feet of water. We can easily watch the anchor dig into the bottom. Towing the dinghy, notice the shadow on the bottom, 10 feet down! We are beginning to ask ourselves….”Why go Home?”…..but lucky for us, we still have a week or two before we need to make the trek north to Rock Hall, MD. It will take 45 days to travel north, and about 3-4 days to work our way up and around the north end of the Abacos. Then again…we could just stay…. Properly named the Elbow Reef Lighthouse in Hopetown, this lighthouse has been actively operating since 1864! The lighthouse is 89 feet tall and stands 120 feet above sea level as it is built on a hill overlooking the harbor. The light is visible for 17 miles. During the most recent hurricane, Irene, Sam the lighthouse keeper kept the light lit and running as it was the ONLY light that was on in the Abacos. Residents commented on seeing the light during the storm and said that as long as it was lit, they knew they would be OK.
Sam, a second generation lighthouse keeper, used to climb the steps as a very young boy with his father as he watched and learned how to manage and maintain this historic lighthouse. We were lucky enough to spend an evening with Sam, who demonstrated the process of lighting the light. First, he preheats the gas mantel with a cup of burning alcohol for 10 minutes. Once hot, the pressurized kerosene mixture can be turned on, and with great skill and caution, the flowing gas is lit. With a loud pop and then a rushing, blow torch sound, and next a hissing and roaring, the lens is quickly filled with the incredibly bright light of the lit mantle! This is all happening while Sam is sitting INSIDE the Fresnel lens, adjusting the gas flow and pressure, making sure that the light is burning properly. Sam is very passionate about his job and he is extremely proud to be one of two lighthouse keepers who live on the property. Sam and Jeff share the night shift and must hand wind and lift the weights with a large crank handle every two hours! Yes, every two hours, they climb the 101 steps to the top of the lighthouse and crank the weights back up to the top. These weights then slowly drop, pulling the gears and rotating the massive Fresnel lens which is resting on bearings and also a bed of mercury! Once the light is lit, the lens is pushed to begin its rotation. The weights are then engaged and the light is officially up and running. It was a true honor to see this process and to hear Sam tell of stories as a child working the lighthouse with his father. Elbow Reef Lighthouse is a world treasure and will soon be the last non-automated lighthouse on earth. Thank you, Sam, for your passion and your love of the Lighthouse….it was an honor to see it with you! Note the hand pump on the right side that adds pressure to the air tanks! The flowing gas is visible here! Sam preparing to light the gas, all while INSIDE the lens! POP, the gas ignites, the roar is heard and the lens is illuminated! Thank you once again, SAM, for your demonstration and your dedication to the Elbow Reef Lighthouse in Hopetown. This visit was especially significant for Radeen, since her dad was a lighthouse tender on an island in Alaska in the late 1930’s. If you are ever in Hopetown, this is a MUST SEE event. Simply go up to the base of the lighthouse before sunset and wait for Sam or Jeff to talk to you about the lighthouse and then climb up to the top with them and watch this historic process. Here is a photo essay focused on the beautiful buildings and surroundings of Hopetown on Elbow Cay, Abaco, Bahamas. Hayden used to teach Architectural Drawing and Passive Solar Design and he really enjoys photographing buildings while focusing on color and detail. Here in Hopetown, on this sunny afternoon, he shot over 100 photos and these are the best 28. Enjoy the tour….this place is so beautiful…. Captions not needed, just photos…. Check out the feet….OK….back to Architecture…. Thank you for taking a look at the architecture and beauty of Hopetown here in the Abacos. Next tour….the Hopetown Lighthouse. Hopetown, on Elbow Cay, is considered by many cruisers to be the Nantucket of Abaco, in reference to the wonderful New England island just south of Cape Cod, MA. Sailing here from Great Guana Cay, once again on a beam reach in east winds, we decided to drop anchor off the island and spend the night. The local yacht club was having their last Sunday small boat race for the season. We ended up being anchored directly at the start line and the race committee set their line and racecourse just off our beam. So, we enjoyed an afternoon of dinghy racing and then we picked up anchor and moved closer to shore for the night. The stars were incredible as there is very little light here at night. Within the constellation of Orion, we saw many stars that we never see at home. The next day, we baked some homemade bread and went for an AM swim and snorkel around the boat before moving into the harbor to secure a mooring ball. We were lucky to get the last one! We may spend a week here….who knows…for now, we have lots to discover here at Hopetown on Elbow Cay, Abaco. Here are the photos of the day…. Look at the water clarity. That is 10 feet and you can see the anchor chain on the sandy bottom. We have only spent one day here in Hopetown, and we plan to stay several days here. One of my goals will be to focus on architecture as this is another one of my passions, so look for a photo essay on this soon. For now, it is back to town to walk and explore the island….golf carts, bikes and walking are the chosen mode of transportation to explore the island. We arrived here at Fisher’s Bay after another wonderful day sail over from Marsh Harbor. This Sea of Abaco is so well protected and with Marsh Harbor as a base, one can easily explore all the beautiful islands surrounding this protected sea. Our mission for going to Great Guana was to take in the beautiful beaches and to also attend the Barefoot Man Concert at Nippers Beach Bar. Barefoot Man is one of the most popular musicians in the Abacos, yet he is from Grand Cayman Island. He has written over 2,000 songs and has recorded 500 songs. His CDs and music is available for download everywhere and sold all over the Islands. 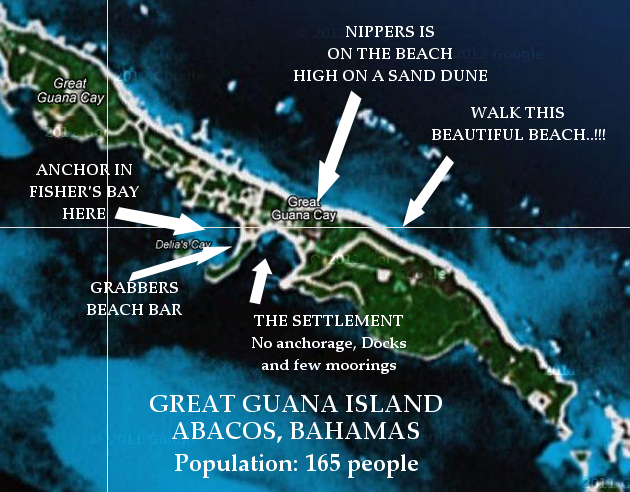 Nippers Beach Bar is THE place on Great Guana, although GRABBERS Beach Bar, which we are anchored off of, is just as popular. Nippers is built up high on a sand dune with a staircase of many steps down to the beach. The beach is one of the most beautiful in the Abacos and just off the beach is a spectacular coral reef that you can snorkel out to and explore. The day before the concert, we arrived and dropped anchor in Fisher’s Bay and then walked the beach over to Nippers to pre-test the “Nipper’s Juice” which we have been well warned about. The bartender said, drink no more than 3 and then walk the beach or else you will not know what you are doing! As evident at the concert, most of us did not take to this warning and we all were under the influence of the NIPPER JUICE! Overall, it was a great time with our Island Packet Fleet. We had the best table in the house, thanks to SP Catspaw team for securing it at 1000am! The concert started at 1pm and lasted til 5pm with everyone dancing and having a great time. Third Floor Deck was filled also and they were dancing on the tables….look out below! The view looking out to the beach with table dancers and all..
“Jean Jean the Dancing Queen” is the lady to the left, she danced more than anyone! I have no idea who the yellow bikini girl is….and Radeen took the photo! The trip from Green Turtle Cay, south to Whale Cay Channel and into the ocean and then back into the Sea of Abaco was a great trip today because Whale Cay passage was calm. After days of high ocean swells and strong winds, the whale was passable and many boats were traveling north and south to their destinations. We ran south heading for Marsh Harbor and had a fantastic sail from the Whale into the ship channel and down the Sea of Abaco and into the Harbor entrance. Winds once again were on the beam, and we had a beautiful easy day of sailing. We have only run the engine a total of 9 hours since leaving Miami. This is incredible, as we have sailed every leg from Miami to Marsh Harbor, and most of it has been on a beam reach. I am beginning to see why some many people sail down to the Bahamas for the winter. It is spectacular and the sailing is good, the water is so blue, and it is “Island Life” at its best. We just bumped into Bob and Nancy, friends from Rock Hall, our home port, and this is their 10th winter in Marsh Harbor. We are beginning to see why…..time for us to spend a few days, a week or more in this area…Our only schedule is…BAREFOOT MAN CONCERT Friday, March 16 and 17 at Nippers, the next Island over. So, with the winds blowing 30 knots for 3+ days, we docked at Green Turtle Club and had an Island Packet Rendezvous with 6 IPs and 12 owners. We played dominoes, rode golf carts all over the island, walked the beaches, explored the town, and enjoyed the clubhouse, pub and dining room. Live it up we did, because we usually do not take a dock and we rarely take a dock for 3 or 4 days, but at the Turtle, it is difficult to leave…why should you? This is looking out to sea from Green Turtle, so way can you move south through the Whale. This is the view of our flags when walking out of the dining room. So, it has been a dream stay, once again, and have really enjoyed the location. If you ever sail into the Abacos, you need to make Green Turtle Cay and White Sand Bay to the north a MUST STOP destination. This is nearly as well run as the Bitter End Yacht Club in the British Virgin Islands and that is saying a lot about this location…..
After arriving West End and clearing into the Bahamas for our first time, we all enjoyed the pool and dinner at the Tiki Hut. From West End, we sailed 55 miles out to Great Sale Cay with a fleet of six Island Packets. Dropping the anchor in 10 feet of water, we easily watched the 44 lb Bruce dig into the sandy bottom as we laid out 100 feet of 5/16″ chain. Sunset that night was so special and the clouds after sunset were even more beautiful. The next day we raised anchor at 0700 and set a reefed main sail at the north end of Great Sale Cay for a 35 mile sail on a close reach for Spanish Cay Marina. The winds were building as we were outrunning a well known frontal system predicted to arrive soon. This front we have been watching since Miami and we planned to take shelter at the docks on Spanish Cay. Now with winds 20-25 and 60 degrees off the starboard bow, we sailed at hull speed all day long. We arrived Spanish Cay at 1430 and with 25 knots of cross winds and 2 foot seas, docking was a bit of a challenge for all members of the fleet. But with fantastic dock hands and help from Spanish Cay Marina, we all were secured and docked by 1530. Spanish Cay Marina has a very friendly staff and a fantastic chef who knows how to make the best conch dinners. Anita, the facility manager, made us all fee so welcome and we nearly had the entire facility to our fleet. We stayed at Spanish Cay Marina Sat and Sun and, with the frontal system through and the winds now down to 20 knots, we plan to move into the Abacos farther and take up base at Green Turtle Cay. The current weather system is blowing hard from the NE and then N and then E with winds forecasted to be 25-30 and even 35 knots! With weather like this, we have all decided to take slips at Green Turtle Club Marina. This is very unusual because most of us always anchor out, but then again the weather is usually 10-15 knots here in March. Overall, this trip into the Abacos has been a dream trip because we have sailed beam winds of 20-25 knots every leg from Miami! Today, we will sail beam winds south into the Green Turtle Cay….this is unreal….lucky us….and we appreciate every second…. More Photos of this leg into the Abacos. The clouds illuminated after sunset over our bow. SunRISE over our buddy boat 37 Dragon’s Toy from California! Yes…the Bahamas are really special and we have only seen TWO islands so far. We can’s wait to discover more as we plan to spend two months here exploring only the Abacos. A dream come true….Thank you for following us. As planned for over a year, we arrived in the Bahamas at West End, Old Bahamas Bay Marina and Resort on March 1, 2012! The crossing over from Miami, Government Cut inlet, is 85 miles to West End. We hoisted our mainsail at 0200 hrs just off anchor behind Fisher Island, and we rolled out a full 135% Genoa/Jib at the sea buoy. After an hour of powering out the inlet in the dark, along with one of our buddy boats IP37 Dragon’s Toy, and we turned off the motor and set sail for a course EAST. The Miami skyline disappeared off our stern in the dark. We dodged one container ship named PAGO, who kindly altered course to starboard so we could pass port to port. The sailing was close hauled, 55 degrees off the starboard bow because we needed to set a course of 70 degrees for a destination bearing 55 degrees due to the set and drift effect of the 3 knot north flowing Gulf Stream, called the Florida Current. We thought we would have a beam reach, but this extra 20 degrees to the right made for a close reach or near beat. Team Island Spirit LOVES to sail upwind, so it was fine with us. With winds 15-18 knots, it was a perfect morning sail. The sun rose over the bow as we sailed East, and we each took turns napping and standing watch as our autopilot and wind vane steering drove us at speeds of 5 knots plus a current of 2.5 knots for a ground speed or SOG of 7.5+ nearly all the way. By 9am the winds backed and we were beam reaching for a wonderful sail in 2-3 foot seas. This backing winds also brought less wind and by 11 am we needed to motor sail since it was less than 10 knots of wind. 8-10 knots would be great in the bay or calm waters, but out in the ocean you need 15+ to really sail through the ocean swells. Usually there is too much wind in the ocean, so this 8-10 was the predicted light wind, which is why we crossed today to avoid high waves in the Stream. Arriving into West End, we hoisted the solid yellow Q Flag, meaning crew and vessel are “quarantined” and have not been cleared into the country. The captain needs to fill out 5,000+ sheets of paper and take all passports and ship’s documents to the customs officer and clear into the country. The customs officer reviewed our papers and passports and collected our fees and gave us a 90 day cruising permit to explore all the Bahama Islands. We plan to explore the Abacos for the next two months!y All our buddy boats, Catspaw, Cutter Loose, Dragon’s Toy, Flatlander and Lark, arrived safely and we enjoyed the pool, the beach and the Tiki Hut Bar and Grill. The water color all the way over was indigo blue, where the depths are over 2,000 feet! Then when we came up onto soundings, meaning water depth our depth meter can read, or sound, the water turned into a NEON BLUE….It is difficult to believe, but it is a truly spectacular color. We feel blessed to be here and to discover this and take it all in. Welcome to the Bahamas…mon…enjoy your stay…. here the water is about 50+ feet deep and you can see the bottom! Radeen drops the Q flag and attached the Bahamas flag. The Bahamas flag is flown from the starboard spreader, the US flag remains on the stern. Hayden, with his sun hat, hoisting the first foreign country flag on Island Spirit. Today, we plan a 50 mile sail across the Bahama Banks to Great Sale Cay where we will anchor for the night. Then, racing the approaching front, we will sail Saturday into the Sea of Abaco and make Allen’s Cay or a dock at Spanish Key for a few days. This next frontal system is showing 30-35 knots North winds and then NE at 30 knots. We have dock reservations in case this system really is that strong. Hey…it’s Radeen’s birthday on Saturday, so we need to bake a chocolate cake and celebrate!